Brand: SG Craftbazar Pvt. Ltd. Designer Zipper Bags on your doorstep! Be ready to catch the attention of every passing eye. This Trendy Party Bag is quite fashionable to look at. Designer bag available in 4 colours with an adjustable belt that can be used as a handbag as well as sling bag. 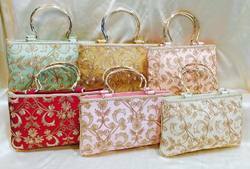 Owing to the efforts of our skilled professionals, we have been constantly engaged in offering a qualitative assortment of Fancy Hand Bag. Ofacto Fashion Exports Pvt. Ltd.
We are continuously engaged in manufacturing and exporting wide range of fin quality Leather Party Bags. 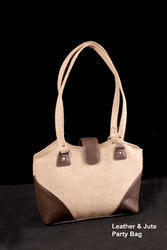 We always use quality leather as the raw material and excellent and remarkable technology for designing these products. These are always available in different shapes, sizes and designs and are capable of meeting the various demands of our clients. Stylish sling in an unique shade with small octahedron pattern.